We speak to Techland about the power of choice in its ambitious zombie sequel. Dying Light 2 boasts the kind of player choices I always dreamed about back when Mass Effect got huge, and the idea of an interactive narrative filtered into different genres outside of traditional RPGs. What if choice was about more than who lives, dies, shags or hates you? What if the entire world around your character actually transformed and you felt the difference? I'm pleasantly surprised that it's the sequel to an enjoyable, best-selling first-person zombie game that's trying to this. At Gamescom 2018, the developer brought the same build that Steven covered back at E3 and dropped a few more details on how choice works. I got to sit down with Techland's producer Kornel Jaskula to talk a bit more about it. The example of a player decision used in the E3 reveal was a water tower. You climb it, and up there find two suspect individuals called Jack and Joe. Fight them to the death, and the water tower can be taken by the Peacekeeper faction, who will clean the place up, add an Assassin's Creed-style tool that lets you instantly ascend a building to get around, and give out free water to the people in the city. The Peacekeepers, though, could one day become your enemy in the game, and if they do, they'll banish you from this location. "It's a small one," says Jaskula, explaining how the water tower conundrum compares to other, larger choices in the game. I ask how the choices evolve over the course of Dying Light 2. "It's not only the visual change, it's not only the change on the game system side, you're going to get access to new quests, or you're going to lose them. You're going to have one group of quests instead of another. "We're creating content that could be present in several games, but we know that some players will miss this content. But we believe that [they'll go] back to the title, play it again to see other outcomes of the story and the city, and how it would look like if you chose differently. We want them to play together in co-op mode to see how different players' cities look, and how their choices shape the city. So when you join me, you're going to see my world, my decisions, my outcome, and I'm going to make decisions in my game. Your story is going to stay as you left it, alone." I had a good time sprinting around Dying Light's world, but I never would've expected its sequel to be the game that presents such a compelling version of player choice. I ask Jaskula about the challenges for Techland in bringing these choices to life. "We have a big wall in our studio in Poland where we have all the connections between those choices written down so everyone can see that on a daily basis," he says. "This is the first step: to imagine this complex city, and how to build the game on top of this complex city. So to do that, we have to change the technology, because the previous one didn't support choices and consequences in-game. So we developed a new engine, which is called C Engine right now, and we changed everything. One of those is the support for choices and consequences. 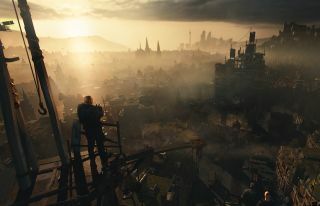 The second one is the size of the city itself—it's four times bigger than the original maps from Dying Light combined, so not only in 2D size, but vertically. It's higher. There's a lot of gameplay inside, and a lot of assets. To support that, we have to change the technology. The main change for our company is the mindset and the technology." Choices can open up or lock off entire parts of the game, then, and in a presentation we're given an example of that. Techland explains how liberating a swimming pool in the city will present a dilemma: if you hand it to the Peacekeepers, they'll create a training ground where you can fight others in an arena, which presumably has some benefits to the player. Another faction, the Untainted, will use the grounds to grow strength-enhancing drugs that they'll give you access to—but this will also affect enemies, making them stronger. Then there's the Scavengers, who'll use the location to grow a new type of fuel, and as a reward, they'll bring vehicles along and repair a bridge, which opens up an entirely new location and quests. But, what if that bridge was keeping something dangerous out of that location? That's now your problem. What we're getting right now, then, between the swimming pool and the water tower examples, is individual instances more than the larger picture of how things fit together. I'm intrigued to know what a mess of things you can make in your relationship between factions, like how you can piss everyone off in Fallout: New Vegas, and I wonder how much game time you can actually miss out on based on your decisions. It's bold and exciting to me, but your choices might not necessarily be irreversible. "Sometimes you're going to make decisions you're going to regret," Jaskula says. "And those big choices you talk about... we want to have a safety net somewhere in the future. If you're not satisfied with your decision, there's going to be some way to turn it around." As for big reveals in Dying Light 2's future, Jaskula asks that we "stay tuned" on what night time looks like in the city, which we haven't really seen yet. A lot of what's been shown so far focuses on human drama and tension between factions, RPG-style, which is naturally a decent catalyst for decision making. What I'm being teased is something I feel like no other developer is close to making right now, and it's hard not to get excited about that. "We always wanted to go with a truly sandbox game, a truly sandbox experience," Jaskula says. "We think this is something that players need, and there's no such game giving that level of freedom with gameplay mechanics and also the story sandbox, as we call it. We wanted to do something fresh, new and memorable for players, to be the first in line with something completely new."